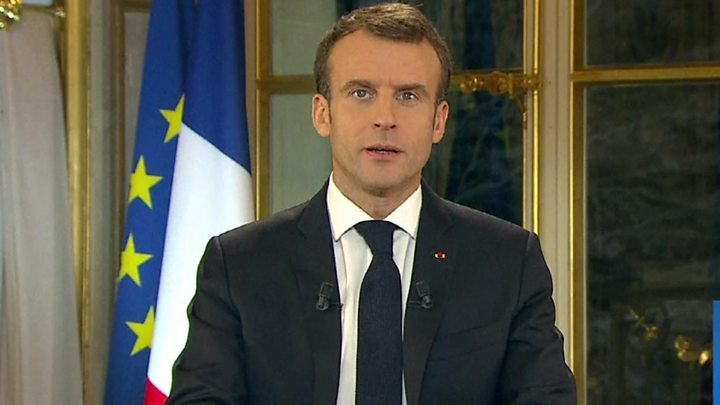 France's President Emmanuel Macron has promised a minimum wage rise and tax concessions in response to weeks of violent protests. Has Macron lost his charm? Government minister Olivier Dussopt told broadcaster BFMTV the total cost of all the measures is likely to be between €8bn and €10bn. "We are in the process of fine-tuning and to see how to finance it," he added. They wanted more than just a politician's promises. They wanted measures, banknotes in their pockets, a tangible change in their impoverished daily lives. President Macron got the message. In fact he had no choice. To have blethered about future challenges and the need for nation-building would have driven the yellow vests to distraction. Four weeks after their first Facebook videos were posted, they have forced a total reorientation of French social and economic policy. And without even making out a formal list of demands. What did Macron say about the protests? Mr Macron, who has until now kept a low profile during the protests, acknowledged that many people were unhappy with living conditions and felt they "had not been listened to". He said that over the last 40 years there had been "a malaise" of "villages and neighbourhoods where public services have been diminishing, where living conditions had deteriorated". There were many "people whose status in society had not been sufficiently well recognised. In a cowardly way, we had got used to it and everything seemed to suggest that we had forgotten them. "I assume my share of the situation - I may have given you the feeling I have other concerns and priorities. I know some of you have been hurt by my words," he added. Mr Macron, a former banker, has previously been criticised for being out of touch and not listening to the struggles of ordinary people. He sought to change this impression on Monday, pledging to meet mayors from all the regions of France, and encourage "unprecedented debate". "We must tackle the question of immigration," he added, while also urging the nation to come together to "change in order to take into account climate change and other challenges". The proposals were dismissed by one yellow vest protester, Benjamin Cauchy, who told France 2 TV: "These are half measures. We feel that Macron has got a lot more to give." His political opponents were also critical: left-wing leader Jean-Luc Melenchon said he expected more protests, right-wing politician Eric Woerth described the moves as a "short-term" solution, and far-right leader Marine Le Pen said Mr Macron had addressed some but not all of his mistakes. Meanwhile, a group of anti-racism NGOs, SOS Racisme, told Le Figaro newspaper they were concerned about Mr Macron's comments on immigration. What is the yellow-vest movement? The protesters adopted the name after a social-media campaign urging people to take to the streets wearing the high-visibility yellow jackets that must be carried in every vehicle in France. They were initially protesting against a rise in duties on diesel, which is widely used by French motorists and has long been less heavily taxed than other types of fuel. Mr Macron had said higher taxes on fossil fuels were needed to fund renewable energy investments. Will the environment be the true victim of France's riots? The movement's core aim, to highlight the economic frustration and political distrust of poorer working families, has widespread support.